Cities that do integration well, do well, argues a new report, From Policy to Practice: Lessons from Local Leadership on Immigrant Integration. Given the timing of the impending adoption of the City’s of Toronto’s new immigration strategy, the Toronto Newcomer Initiative (a report with many graphics and colourful pictures), I thought it timely to look at what other substantive work is being done. Where the academic-driven Welcoming Community Initiative is looking at settlement issues across the province, Cities of Migration has focused strengthening knowledge translation in urban areas across Europe and North America. Its most recent report is a series of paper from various researchers and foundations (including Toronto’s own Myer Siemiatycki). The authors provide numerous examples of how cities in the West are becoming more inclusive. Increased local and international mobility is the new norm. 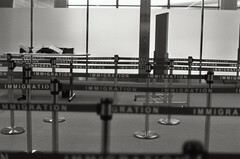 Migration is often a circular process, with people, capital and cultural exchange moving back and forth across borders. Policy at each level of government can make the environment more or less welcoming. Non-profits and other civic organizations are instrumental in these settlement processes. Newcomers move to cities but settle in neighbourhoods. Activities tend to be locally focused, so welcome initiatives should be too. Newcomers are also less likely to be setting in the downtown core of major cities, but are living in their suburbs or smaller, secondary cities. Cities are welcoming the entrepreneurial activities of newcomers, providing support, networking, etc. Opening up labour market opportunities is key, through targeted employment assistance and business start-up assistance. “Living wage” is being recognized as an important policy commitment at the municipal level. Cities have a role as employers and as funders to enhance economic opportunity for newcomers. Cities have a role in planning and zoning by-laws, fostering business opportunities and new cultural/faith spaces. City space creates opportunities for exchange and interaction, so that strangers can become neighbours. City programming, through libraries, parks, and recreation, can promote immigrant integration. City governments have a role in procurement to create economic opportunities for newcomers. City governments have an important role in building civic engagement opportunities, including voting, identity cards, etc. Improvements, they note, help multiple groups. Youth, for instance, are as likely to benefit from these initiatives as newcomers. 1. Encourage the mayor to become a public champion for immigrant integration. 2. Ensure immigrants, including non-citizens, can participate in the democratic process. 3. Lead by example and set the new standard for inclusive hiring practices. 4. Target initiatives to multiple demographic groups with similar needs and experiences. 5. Rely on good, longitudinal data to measure and target programs and services. 6. Recognize that your city is competing for immigrants.